BARCELONA -- As Internet of Things devices become ubiquitous, consumers will someday pay for gas, parking and tolls from their cars without using a credit card or even stepping out of the vehicle. Technology is also emerging that relies on a person's fingerprints recorded with the wave of a hand to make a payment without a card, smartphone or physical token. At Mobile World Congress here, financial services company Visa and auto maker Honda showed off the capability to securely pay for parking and gas from a display inside the vehicle. Security for a user's Visa account would be stored, in encrypted form, on what's called a secure element stored on a chip in the cloud or in the car's brain, called the head unit. 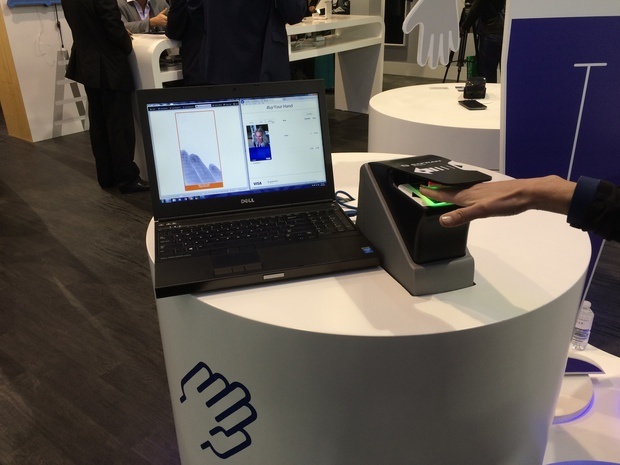 Visa showed off the ability to make a store payment with the wave of a hand, with fingerprints read at a terminal by Safran Morpho. "You could even attach dynamic data elements to each transaction," which would add even more security, said Bill Gajda, senior vice president of innovation at Visa, in an interview. To make a payment for gas or parking, location technology might come into play to identify which parking space or gas pump is being used. Or, a customer might enter a space number or pump number on the dashboard display, with the payment then quickly deducted from the customer's account through a wireless connection. Safran Morpho also has the ability to verify with an infrared image of the person's fingers if there is blood flowing through the capillaries under the skin to provide proof-of-life, or "live-ness." Proving a customer's fingers are alive, and not a spoof, would matter in remote locations, such as a rural train station, where no clerk was available. 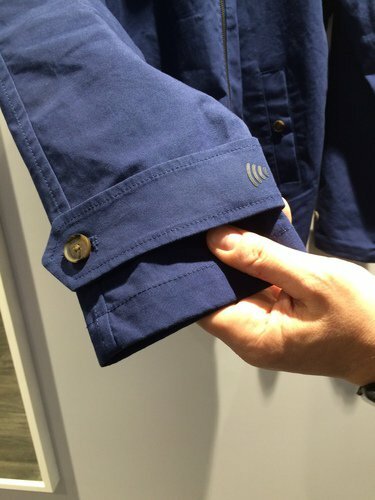 Visa displayed NFC in key fobs and on the cuff of a jacket for making payments. Visa also displayed a variety of near-field communication chips embedded in key fobs and even the cuff of a jacket that can be used to make payments. NFC is being used by Apple Pay and Samsung Pay, among others, in smartphones for quick payments, and adoption rates are steadily rising. Gajda said the move to NFC in all sort of objects and in-car payments is a step in Visa's steady movement to replace cash and checks. "That's our competition -- cash and checks," he said. Since so many people already have smartphones, many equipped with NFC for payments, why would anyone want to put secure payment information in a car's computer? Gajda said that having that payment data in a car would make it easier to pay for tolls, as a car quickly passes a toll gate. The same approach might apply to passing an entry point to attend a football game, paying for parking and potentially for the tickets. Because Visa and other card companies are expected to add dynamic data elements, like a unique code, to each transaction, it means that even if a hacker somehow stole credit card information from a car, that person's account could not be used elsewhere for purchases, Gajda said. With so many ways to pay in the future, credit card companies are now referring to "ambient commerce" for the "ambient consumer." "It can be seamless," Gajda said. "People just want to conduct commerce, they don't want to pay." Gajda said that ease of payments with emerging technologies will be important in developed countries, but also in other countries that depend heavily on cash. "In some emerging countries, it is dangerous to carry cash," he said.